1. When can I expect to receive my hoverboard? If you order your hover board before 7pm PST it will be shipped out next day. Shipping time takes 3 to 5 business days depending on your location. 2. 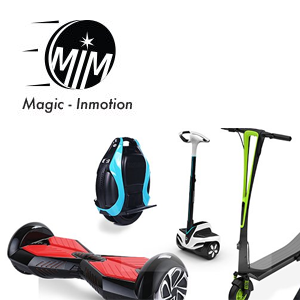 Are Magic Inmotion products safe? We use high quality components in all of our products. Both the battery and charger in our hoverboards are UL certified so you can be confident you are receiving a safe product. 3. How do I charge my hoverboard? Every hoverboard comes with its own charger which is compatible with a USA standard 120 volt wall outlet. After plugging the charger into the wall please ensure that a green light appears on the charger. If there is no green light on it, please contact us: CLICK HERE. 4. How do I reset my hoverboard? If you believe your hover board is not functioning like it should, it probably just needs a reset. CLICK HERE TO VIEW THE TUTORIAL VIDEO. It is important the unit is level and not moved during the process. You may need to do this reset process at least 5 times in a row. If you have any further questions we are here for you. If resetting didn’t help, please contact us: CLICK HERE. 5. What is turnaround time for repaired hover board? it would take approximately 2 weeks for us to repair and send it back to you. All returned product must be in new/unused condition, in original packaging, and returned within 15 days of original purchase date. Customer pays shipping costs and must include proof of purchase with returned item. For all canceled and returned orders, there is a 15% restocking fee applied to any order that has already been shipped.